Two halls available to hire. Hire charges by commercial users are by negotiation, otherwise rates are as listed. 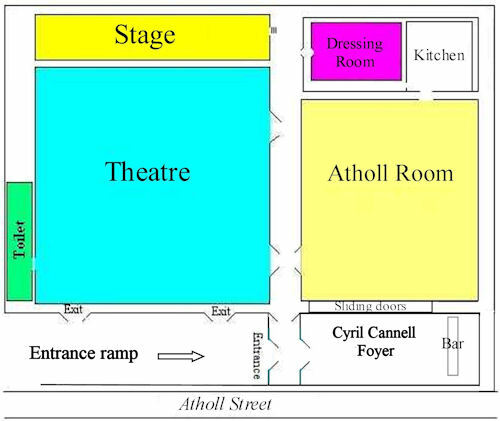 Theatre seating for Concerts, Drama, Variety shows, Lectures etc. Theatre style seating for up to 200. Fully equipped lighting, sound and studio quality recording facilities. Please note – The hire fees for the Theatre will be increasing from 1st January 2018 to reflect an increase in our operating costs. Therefore, the standard full hire (Theatre together with technical crew) will increase from £300 to £350. The ideal room for: Yoga, Exercise and Dance. Tables and chairs can be arranged to suit requirements. Fully licensed bar serving Ales Wines & Spirits on request (£25 fee may be payable for bar with Atholl Room bookings). Outside these times the room can be hired at £10 per hour per one-hour sessions. The Centre is licensed with the Performing Rights Society. Hirers are liable to pay a PRS fee additional to the hire charge. Any queries please contact Dave McLean 845146. The Centenary Centre now has its own Disabled Toilet Facilities.